The infamous quad-copter U45 sees a polished and an upgraded version as it comes with VR compatibility and Wi-Fi FRV, along with a sleek finish. The device bears a first person view along with a VR headset compatibility. Users can glance at live video feeds of the flight positions from an iPhone or Android Smart mobile device with the FPV WiFi feature. The device is easy to use for beginners and is completely hassle free as it comes with the ALTITUDE HOLD FUNCTION. One can set the drone to fly at a preferred height. This feature makes controlling the drone extremely easy for beginners and also helps them with aerial photography as well as crisp videography. U45W is ideal for beginners primarily for the fact that it contains a lot of the latest features that are generally seen on higher end/upgraded models, at a high price. What makes this drone more appealing you ask? Well it is its ‘ONE TOUCH TAKE OFF AND LANDING’ feature. The drone will fly at a set altitude after its take off and will stick to that particular height. Upon landing the drone will slowly move at the set altitude and will then fly down and land gently on the ground before the motors stops to spin. 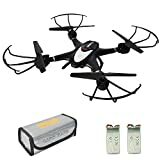 This is commendable as prior to its landing it becomes easier to control and manipulate the drone, hence this helps especially the beginners who are not well equipped with flying drones. This product promises to pose fewer difficulties for the beginners; therefore it is manufactured with a ‘CUSTOM ROUTE MODE’. Users can direct their desired path that the drone should follow, on the mobile app. The drone will fly along the path directed by its user, and yes it does not require further assistance on that path. This quadcopter comes with an HD Camera. 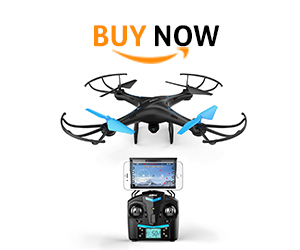 It captures a 720p high definition aerial photos and videos with the 2MP camera. It can be synced to the controller to make the flights seem more lifelike. The video footage has been upgraded to 1280 X 720 at 30 FPS. – As it has Wi-fi connectivity one can view the flight of the drone through FPV (first person view). – The VR headset can be synced directly with the controller. – The ‘Headless Mode’ helps the pilot to fly the drone to any direction/location necessary without worrying about the position of the aircraft. The U45W Blue Jay is a light-weighted machine that is specially designed keeping in mind the novice pilots. Not only is the drone user-friendly and easy for anyone using for the first time, but its sleek design is definitely an eye-catcher as well.